Ambre has worked hard to hone her musical abilities through performances, studies, and composition. She holds a bachelor of arts degree in music therapy, including a full-time internship in an elementary school and in long-term care, providing music therapy with these populations. 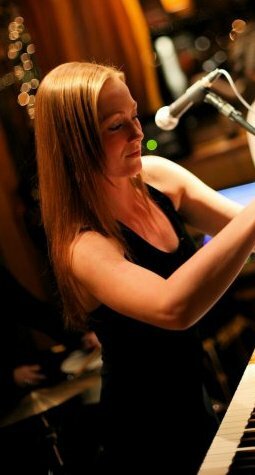 She has a three year diploma in jazz music performance from Vancouver Island (2004) and currently manages her jazz quartet, Espresso Martini (to book, go to contact). Espresso Martini has been performing live for ten years throughout Vancouver and Vancouver Island. They play private parties, weddings, lounges and small stages, with a reputation for a unique sound, amazing vocals and musicianship, professionalism, presentation, and mixing traditional with modern jazz. Ambre is comfortable in the contexts of both studio and live performance. Her style is influenced by many vocalists such as Billy Holiday, Erykah Badu, Jill Scott, Nina Simone, Astrud Gilberto, and Betty Carter. Her own style ranges from R&B to jazz. Born and raised on Vancouver Island, some of Ambre’s earliest singing experiences were at church. She started classical piano at the age of seven. When Ambre was ten years old, she attended a school with an established musical theatre program in which she was actively involved. During this period, she began private vocal training, and continued classical piano lessons. The musical theatre training helped her land a television commercial and develop a passion for being involved in performance and music. Ambre studied ballet, tap and jazz dance at a young age and continued later to take hip-hop and yoga. From a young age, Ambre was committed to writing poetry and journals. She recalls writing songs at the age of eleven and singing them on friend’s answering machines, at school lunch hour and in made-up plays, for which she would organize rehearsals. At fourteen, she composed her first classical piano piece by ear, Rain. At the age of sixteen, Ambre’s home had a fire and she and her father lost everything. Among the lost items were her keyboard, journals, photos, her dad’s paintings, four electric guitars and one acoustic. Friends and strangers in the small community on Vancouver Island made an impressive impact on helping out. Ambre moved out on her own at the age of seventeen. Working and living on her own, Ambre managed to pay off her white rabbit convertible, and buy her ticket to Australia, where she recorded her first demo CD, at the age of eighteen. There she lived with two girls from England, in Sydney, one of whom was also a jazz singer. They recorded and wrote music together. Ambre went on to study Jazz at University for three years, including theory, arranging, lessons, history, combos, studio, and choir, but still considers real life experience and practice, especially playing in combos, to be most important to musical growth. However, the studies helped Ambre to focus her future, learn as much as she could musically, and manage her time. She was also recording, taking dance classes, and studying yoga at that time. Ambre currently sings and plays piano with a jazz trio, with stand-up bass, drums and guitar, teaches piano and yoga, and is working as a music therapist while writing and recording her next album. Her trio is available for private parties, corporate functions and lounge acts. Ambre’s current album debut, Path of Soul, draws upon her life experiences and reflects various musical and spiritual influences, available on CD baby, at her shows and on this web site. It features rhythm and blues, jazz vocal styling, and hip-hop beats. Ambre’s vocals are tastefully inflected with her piano playing for most of the tracks and the album consists of exclusively original material, featuring fresh lyrics accompanied by hip-hop beats, lush acoustic instrumentation, and a soulful depth. By request, this album also features one jazz standard, Stormy Weather. There’s also a jazz / pop sample in the music page. Her next album is turning to be more instrumental, jazzy, bluesy and even more unique than her current recordings, resembling a musical and personal maturity and growth, as well as offering clever lyrics, easy listening ambiance and inspiring musical and emotional appeal. To buy her current album, go to the home page. After working with children with her mom and playing jazz in Thailand in 2008, various performances and recordings in Canada beforehand, Ambre returned from Thailand to finish her music therapy degree, perform and work on her next album. The stage is set for Ambre to continue forth in a unique and enriching musical career. Currently underway are performances, a new album, and working with children and seniors, both teaching piano and through music therapy. Helping people through music has been a passion for Ambre from a young age. When she was eleven she would go and sing at seniors’ homes and visit the seniors after her choir performed there. Check out “Path of Soul” on CD Baby or I Tunes, at her shows, or on the home page and stay tuned for upcoming performances and sound clips. Please feel free to contact Ambre through the contact here, or email ambresong (@gmail.com) for bookings or music therapy inquiries.